An Indian Hindu wedding ceremony in progress. A Hindu wedding is Vivaha (Sanskrit: विवाह) and the wedding ceremony is called Vivaah Sanskar in North India and Kalyanam (generally) in South India. Hindus attach a great deal of importance to marriage. The wedding ceremonies are very colourful, and celebrations may extend for several days. The bride's and groom's home—entrance, doors, wall, floor, roof—are sometimes decorated with colors, balloons, and other decorations. At each step promises are made by (in the long form—see below) each to the other. The primary witness of a Hindu marriage is the fire-deity (or the Sacred Fire) Agni, in the presence of family and friends. The ceremony is traditionally conducted entirely or at least partially in Sanskrit, considered by Hindus as the language of holy ceremonies. The local language of the bride and groom may also be used. The rituals are prescribed in the Gruhya sutra composed by various rishis such as Baudhayana and Ashvalayana. The pre-wedding and post-wedding rituals and celebrations vary by region, preference and the resources of the groom, bride and their families. They can range from one day to multi-day events. Pre-wedding ceremonies include engagement, which involves vagdana (betrothal) and lagna-patra (written declaration), and the arrival of the groom's party at the bride's residence, often as a formal procession with dancing and music. The post-wedding ceremonies may include Abhishek, Anna Prashashan, Aashirvadah, and Grihapravesa – the welcoming of the bride to her new home. The wedding marks the start of the Grihastha (householder) stage of life for the new couple. 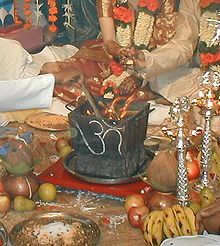 In India, by law and tradition, no Hindu marriage is binding or complete unless the ritual of seven steps and vows in presence of fire (Saptapadi) is completed by the bride and the groom together. This requirement is under debate, given that several Hindu communities (such as the Nayars of Kerala or Bunts of Tulu Nadu) do not observe these rites. A Hindu bride during her wedding. Daiva marriage – the father gives away his daughter along with ornaments to a priest as a sacrificial fee. This form of marriage occurred in ancient times when yajna sacrifices were prevalent. Arsha marriage – the groom gives a cow and a bull to the father of the bride and the father exchanges his daughter in marriage. The groom takes a vow to fulfill his obligations to the bride and family life[clarification needed] (Grihasthashram). Prajapatya[clarification needed]marriage – a couple agree to be married by exchanging some[clarification needed]Sanskrit mantras (vows to each other). This form of marriage is akin to a civil ceremony. Gandharva marriage – the couple simply live together out of love, by mutual consent, consensually consummating their relationship. The marriage is entered into without religious ceremonies, and is akin to the Western concept of Common-law marriage. The Kama Sutra, and, in the Mahabharata, Rishi Kanva, the foster-father of Shakuntala, claim that this form of marriage is ideal. Asura marriage – the groom offers a dowry to the father of the bride and to the bride; both accept the dowry out of free will, and he receives the bride in exchange. This is akin to marrying off a daughter for money, and is considered inappropriate by Hindu Smriti-writers because greed, not what is best for the woman, can corrupt the selection process. Paishacha marriage – where the man forces himself on a woman when she is insentient: when she is drugged or drunken or unconscious. James Lochtefeld comments that these last two forms were forbidden but the marriages themselves were still recognized in ancient Hindu societies, not to allow these acts but rather to provide the woman and any resulting children with legal protection in the society. There is no single standard Hindu marriage ceremony. Regional variation is prevalent in the sequence of rituals comprising the ceremony. There is also considerable flexibility within each ritual. Variation reflects family traditions, local traditions, resources of the families and other factors. Three key rituals predominate, as follows. Two are yajna. Kanyadaan – the giving away of his daughter by the father. Panigrahana – a ritual in presence of fire, where the groom takes the bride's hand as a sign of their union. Saptapadi – the crucial ritual. The term means ‘seven steps’, with each step corresponding (in the Long Form) to a pair of vows: groom to bride, and bride to groom. The vows are pronounced in Sanskrit; sometimes also[clarification needed] in the language of the couple. (For the Short Form see below.) Like Panigrahana, Saptapadi is performed in presence of fire, and in many weddings, after each of their seven oaths to each other, the groom and bride perform the ritual of agnipradakshinam: walking around the fire, with hands linked or with the ends of their garments tied together. The groom usually leads the bride in the walk. [clarification needed] Fire is the divine witness (to the marriage), and after Saptapadi the couple are considered husband and wife. Kanyadaan – a key ritual where the father gifts away the daughter to the groom. In this picture, the father's hand is on the left, the bride and groom are on the right. Who offered this maiden?, to whom is she offered? After this ritual recital, the father asks the groom to not fail the bride in his pursuit of dharma (moral and lawful life), artha (wealth) and kama (love). The groom promises to the bride's father that he shall never fail her in his pursuit of dharma, artha and kama. The groom repeats the promise three times. This repeated promise by the groom marks the end of the kanyadaan ritual in the Hindu wedding. The ritual of Panigrahana comes after Kanyadaan. It is sometimes preceded by the vivaha-homa rite, wherein a symbolic fire is lit by the groom to mark the start of a new household. In the Gujarati Wedding[clarification needed] this step is called Hast-Milap (literally, “meeting of hands”). The whole ceremony[clarification needed] was[clarification needed] timed around an auspicious time (Mauhurat) for this step and a few decades ago the wedding invitation would even list the time when this event was going to take place. A Hindu couple in post-marriage ceremonies, after Saptapadi. The tied clothing, represents lifelong bond formed during the seven promises ritual with fire as witness. The Saptapadi (Sanskrit “seven steps”/“seven feet”; sometimes called Saat Phere: “seven rounds”) is the most important ritual of Vedic Hindu weddings, and represents the legal element of the Hindu marriage ceremony. The couple conduct seven circuits of the Holy Fire (Agni), which is considered a witness to the vows they make to each other. In some regions, a piece of clothing or sashes worn by the bride and groom are tied together for this ritual. Elsewhere, the groom holds the bride's right hand in his own right hand. Each circuit of the consecrated fire is led by either the bride or the groom, varying by community and region. Usually, the bride leads the groom in the first circuit. In North India, the first six circuits are led by the bride, and the final one by the groom. In Central India and Suriname, the bride leads the first three or four circuits. With each circuit, the couple makes a specific vow[clarification needed] to establish some aspect of a happy relationship and household for each other. "Now let us make a vow together. We shall share love, share the same food, share our strengths, share the same tastes. We shall be of one mind, we shall observe the vows together. I shall be the Samaveda, you the Rigveda, I shall be the Upper World, you the Earth; I shall be the Sukhilam, you the Holder – together we shall live and beget children, and other riches; come thou, O beautiful maiden!" The long form of Saptapadi starts with a preface announced by the priest, introducing a series of vows the groom and bride make to each other, as follows. With the completion of the seventh step the two become husband and wife. The world of men and women, united in the bond of marriage by Saptapadi, to further promote the joy of life, together listen with triumph. Groom's vow: Oh!, you who feeds life-sustaining food, nourish my visitors, friends, parents and offsprings with food and drinks. Oh! beautiful lady, I, as a form of Vishnu, take this first step with you for food. Bride's vow: Yes, whatever food you earn with hard work, I will safeguard it, prepare it to nourish you. I promise to respect your wishes, and nourish your friends and family as well. Groom's vow: Oh!, thoughtful and beautiful lady, with a well managed home, with purity of behavior and thought, you will enable us to be strong, energetic and happy. Oh! beautiful lady, I, as Vishnu, take this second step with you for the strength of body, character and being. Bride's vow: Yes, I will manage the home according to my ability and reason. Together, I promise, to keep a home that is healthy, strength and energy giving. Groom's vow: Oh!, skillful and beautiful lady, I promise to devote myself to earning a livelihood by fair means, to discuss, and let you manage and preserve our wealth. Oh! dear lady, I, as Vishnu form, cover this third step with you to thus prosper in our wealth. Bride's vow: Yes, I join you in managing our income and expenses. I promise to seek your consent, as I manage our wealth, fairly earned, so it grows and sustains our family. Groom's vow: Oh!, dear lady, I promise to trust your decisions about the household and your choices; I promise to dedicate myself to help our community prosper, the matters outside the house. This shall bring us respect. Oh! my lady, I, as Vishnu, take this fourth step with you to participate in our world. Bride's vow: Yes, I promise to strive to make the best home for us, anticipate and provide necessary things for your worldly life, and for the happiness of our family. Groom's vow: Oh!, lady of skill and pure thoughts, I promise to consult with you and engage you in the keep of our cows, our agriculture and our source of income; I promise to contribute to our country. It shall win us future. Oh! my skilled lady, I, as Vishnu form, take this fifth step with you to together grow our farms and cattle. Bride's vow: Yes, I promise to participate and protect the cattle, our agriculture and business. They are a source of yoghurt, milk, ghee, and income, all useful for our family, necessary for our happiness. Groom's vow: Oh!, lovely lady, I seek you and only you, to love, to have children, to raise a family, to experience all the seasons of life. Oh! my lovely lady, I, as Vishnu, take this sixth step with you to experience every season of life. Bride's vow: Feeling one with you, with your consent, I will be the means of your enjoyment of all the senses. Through life's seasons, I will cherish you in my heart. I will worship you and seek to complete you. Groom's vow: Oh friends!, allow us to cover the seventh step together, this promise, our Saptapad-friendship. Please be my constant wife. Bride's vow: Yes, today, I gained you, I secured the highest kind of friendship with you. I will remember the vows we just took and adore you forever sincerely with all my heart. Hindu wedding with the bride and groom in traditional dress. Some Indian weddings abroad symbolically maintain some of the customs in India. Above is a symbolic arrival of the groom on a horse (baraat), in Nottingham, England. In front is the band. Many Hindu weddings start with the milne (meeting) and swagatam (welcome) ceremony. This ritual is where the baraat (groom's procession party) arrives at the bride's home or the location where the bride is and marriage will be celebrated. The baraat typically includes dancing and joyous members of groom's family, relatives and friends. On their arrival, there is a ritual where key persons from the groom's side and bride's side are introduced to each other. The introduction is typically followed by jai mala (garland exchange between bride and groom) and a reception that serves food and drinks. Many other rituals and ceremonies are sometimes found in Hindu weddings, such as madhuparka, vivaah-homa, agni-parinayana, asmarohana, laja homa, abhishek, anna-prashashan, and aashir-vadah. All these ceremonies are carried out at the wedding location, typically at or near the bride's home. These additional rituals include the participation of the brothers, sisters, maternal/paternal relatives, guardians, or friends of the bride. In some parts of India, such as Gujarat and Northern India, a laja homa ritual called mangal pherā is performed where the couple make four circles around holy fire. It follows hasta milap (meeting of hands of the couple), but precedes saptapadi. The first three circles is led by the groom, and it represents three of four goals of life considered important in Hindu life – Dharma, Artha, Kama. The fourth circle is led by bride and it represents the fourth goal of life – Moksha. After saptapadi, as hymns are being recited, the groom performs māņg sindoor ritual where a saffron or red color powder is marked into the parting of the wife's hair. Instead of circling the fire and other steps, the rituals and ceremonies may be performed symbolically, such as stepping on small heaps of rice or throwing grains into the fire. Some rituals involve rice or other grains, seeds and pastes. In these ceremonies, rice is thrown at the bride, groom or they kick a container containing the grain. Rituals include darshan, where the newly married couple are met, blessed and greeted by family and friends of the bride and groom. After the Hindu wedding is complete, the bride leaves for groom's home via groom's car. In groom's car, bride and groom sit together, and groom's younger brother drive the car. bride's two sister also come with groom's family, when they arrive to groom house where Hindu family members of the groom welcome the newly wedded couple in a ritual known as grihapravesa (home coming/entry). This ceremony typically requires participation of the mother, father, brothers, and sisters, or other guardians of the groom. Ancient literature suggests the Hindu couple spent time with each other, but delayed the consummation for at least three nights following the wedding. Some scholars have proposed the observance of this rite in the past – known as chaturthikarma – “the rite performed on the fourth day of marriage”. Chaturthikarma is followed by most of South Indian communities as a possible basis for the validity of a marriage. Other scholars suggest saptapadi and regionally customary wedding rituals, not consummation, defines legal validity of a Hindu marriage. The Hindu Marriage Act of 1955, Article 7, is consistent with the latter. Chaturthikarma is not a common practice in Hindu communities. In modern Hindu families, the couple proceed to honeymoon after grihapravesa. The bride is ceremoniously decorated, in Hindu weddings, by her friends and family in regional dress, jewelry, and body art called Mehndi. The body art is produced from a mixture of henna and turmeric. Above a Nepali bride. In the Hindu culture of Nepal, marriage rituals are done by the Chhetri in a sixteen step process that centers on the household. The household is important during the marriage ritual because it is the center of the concept of mandala; the Chhetri's homes are considered to be domestic mandalas and so have roles as householders. The act of marriage brings men and women into the householder role. Marriage is the most important rite of passage for the Chhetris and is one of the most serious. Women move from their houses to the home of the groom after marriage. The ceremony is done in a precise and careful manner as to not bring bad luck to the families of the bride and groom; certain traditions, for example no one seeing the face of the bride until the end, are followed in order to ensure future prosperity. Prior to the marriage ceremony, there is no kinship between families of the bride and groom and the bride must be a virgin. The marriage ceremony consists of a series of rites that are performed over a two-day period between the houses of the bride and the groom. Within each home the enclosed area in the courtyard (jagya) and the kitchen are used the most; the jagya and the kitchen are considered the most important parts of the domestic mandala structure because it is where rice (an important part of the Chhetri's culture) is prepared and consumed. At the end of the ceremony is the establishment of the role of the wife and husband in the husband's home. The first step in the marriage ceremony is called Purbanga. In the kitchen of their homes, the bride and the groom worship the seven Mother Goddesses as so to pay respect to their ancestors and ask for peace. In the second, third, and fourth step, the groom is then blessed by his mother and is taken outside to his jagya where his father and procession (janti) carry him and bring gifts for the bride to her house in a ceremony called dulähä anmäune. In the fifth step as the groom waits before the house of the bride, gifts of clothes and food are placed around the jagya; the father of the bride then places red paste on the groom's forehead indicating that he is no longer an outsider to his family. The sixth step is the performance of the Barani or welcoming for the groom and his janti as they enter the jagya. The father purifies the body of the groom using panchämrit (nectar from five pure liquids). A small feast is then held for the groom as the next steps in the marriage continue. After the small feast, the marriage process for the bride begins. The seventh step takes place in the kitchen of the bride where the process of kanya dan starts; the bride's parents give their daughter in marriage to her groom thereby allowing the bride to be a part of the groom's lineage and making the father's lineage secondary. After they wash their feet they dress in red and, in the eighth step, sit beside in each other in the jagya. They perform post-marriage rites as they make sacrificial offerings to the fire in the center of the jagya. During these rites the bride and groom perform tasks such as placing red powder in the hair of the bride and the bride eats leftover food of the groom and at the end the now husband gives his wife a personal name for which she is to be called by. After the post-marriage ceremony, the married couple being to leave the bride's home. In the ninth step, the husband and wife return to the kitchen of the wife and worship their ancestors and the seven Mother Goddesses. In the tenth, eleventh, and twelfth step, the couple leave the wife's house as she is given a garland from her parents; the wife and husband enter the jagya and are then escorted out riding on palanquins as they return to their permanent home of the husband. The thirteenth step beings once they enter the jagya of the groom and his virgin sisters welcome the wife in a ceremony called arti syäl. They unveil the bride and adorn her with flower garlands and sprinkle puffed rice on her (a sign of prosperity). The fourteenth step is completed once the bride promises gifts to the sisters; she then moves on the fifteenth step where she steps on piles of rice in a path toward the kitchen. The final step is a series of rites, the first of which is the bride worshiping the ancestors and deities of the husband; she then demonstrates her skills in handling rice to the husband's mother and sisters and then they entwine her hair. Finally, the mother unveils the bride again in front of the husband and in a ceremony called khutta dhog, the bride places the foot of the mother on her forehead thereby ending the marriage ceremony. While there are many rituals in Hinduism, such as those at birth and deaths of loved ones, the Hindu wedding is the most important and extensive personal ritual an adult Hindu undertakes in his or her life. Typical Hindu families spend significant effort and financial resources to prepare and celebrate weddings. In 2008, Indian weddings market was estimated to be $31 billion a year. Various sources estimate India celebrates about 10 million weddings per year, and over 80% of these are Hindu weddings. The average expenditures exceed US$3,000 per wedding. Another $30 billion per year is spent on jewelry in India, with jewelry for weddings being the predominant market. 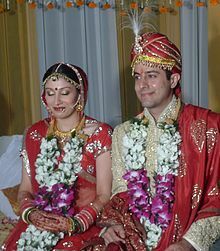 In a nation with per capita annual income of $1,500, weddings are a major financial burden for the typical Hindu family. In India, where most Hindus live, the laws relating to marriage differ by religion. According to the Hindu Marriage Act of 1955, passed by the Parliament of India, for all legal purposes, all Hindus of any caste, creed or sect, Sikh, Buddhists and Jains are deemed Hindus and can intermarry. By the Special Marriage Act, 1954, a Hindu can marry a person who is not Hindu, employing any ceremony, provided specified legal conditions are fulfilled. By Section 7 of Hindu Marriage Act, and tradition, no Hindu marriage is binding and complete before the seventh step of the Saptapadi ritual, in presence of fire, by the bride and the groom together. In some cases, such as South Indian Hindu marriages, this is not required. A Vedic sage emphasized that the basis of happy and fulfilling married life is the sense of unity, intimacy and love between husband and wife both physically, mentally and spiritually. Hence wife is considered to be the Ardhangani of husband as per Hindu tradition. Marriage is not for self-indulgence, but is considered a lifelong social and spiritual responsibility. Married life is considered an opportunity for two people to grow as life partners into soul-mates. ^ Sanskrit English Dictionary, entry for Vivaha. Germany: University of Koeln. ^ a b Prinja, N. (2009 August 24). Hinduism & Weddings. London, UK: BBC News. ^ a b c d e f g h i Pandey, R. (1969). Hindu Saṁskāras: Socio-religious Study of the Hindu Sacraments, see Chapter VIII, pp. 153–233. ISBN 978-8120803961. ^ a b c Yee, A. (2008 May 17) Sari nights and henna parties. The Financial Times. ^ a b c d e f g Lochtefeld, J.G. (2001). The Illustrated Encyclopedia of Hinduism: A–M, p. 427. ISBN 978-0823931798. ^ a b c Bajpai, S. (2011). The History of India - From Ancient to Modern Times, pp. 4, 73–74. Hawaii: Himalayan Academy Publications, ISBN 978-1-934145-38-8. ^ a b Government of India. (1955). The Hindu Marriage Act, 1955, Section 7.2 . ^ a b Menski, W. (2001). Modern Indian Family Law, p. 26. Routledge, ISBN 978-0700713165. ^ a b staff article. (September 2011). Eight forms of Hindu Marriage and its custom. India Tribune. ^ Kane, V. (1962). History of Dharmasastra. ^ Roy, R. (2004). Saptapadi – The Seven Steps. University of Canterbury, UK: Ph.D. Thesis. ^ Sharma, A. (1985). Marriage in the Hindu religious tradition. Journal of Ecumenical Studies, 22 (1), 69–80. ^ a b c d e Prabhu, P.H. (2011). Hindu Social Organization, pp. 164–165. ISBN 978-8171542062. ^ a b c d e Kane, P.V. (1974). History of Dharmasastra – Ancient and Medieval Civil Law in India. 2.1. Bhandarkar Oriental Research Institute. pp. 531–538. .
^ Williams, M.M. (1893). Indian wisdom; or, Examples of the religious, philosophical, and ethical doctrines of the Hindus. London: Luzac & Co.
^ Office of the Registrar General, Government of India. (1962). On Hindu wedding rituals, v. 20, pt. 6, no. 2. New Delhi, India: Manager of Publications, Government of India. ^ a b c Sinha, S.K. (2008), Basics of Hinduism, Unicorn Books, ISBN 81-7806-155-4, The two make the holy vow in the presence of Agni ... In the first four rounds, the bride leads and the groom follows, and in the final three, the groom leads and the bride follows. While walking around the fire, the bride places her right palm on the groom's right palm and the bride's brother pours some unhusked rice or barley into their hands and they offer it to the fire ... .
^ Government of India, Office of the Registrar General (1962), Census of India, 1961, v. 20, pt. 6, no. 2, Manager of Publications, Government of India, The bride leads in all the first six pheras but follows the bridegroom on the seventh. ^ South Indian Wedding, SanathanaDharma.com, retrieved 21 May 2009, ... The Ritual of the Hindu Wedding too is each symbolic ... .
^ Sapthapathi Manthras – Its meaning, bnaiyer.com, archived from the original on 25 July 2008, retrieved 21 May 2009, ... they both say: Now let us make a vow together. We shall share the same food, share the strengths ... .
^ www.sophieanand.com Archived 13 January 2007 at the Wayback Machine. ^ A South Indian Wedding – the Rituals and the Rationale: The Vedic ceremony of the Tamil Shaivite Brahmin community, SAWNET, archived from the original on 12 May 2008, retrieved 21 May 2009, ... The gates of the wedding hall are adorned with full-grown plantain trees, signifying evergreen plenty for endless generations ... .
^ Warner, D. (2006), Diane Warner's Complete Book of Wedding Vows: Hundreds of Ways to Say "I Do", Career Press, ISBN 1-56414-816-5, ... We have taken the Seven Steps. You have become mine ... .
^ Sehgal, S. (1969), Hindu marriage and its immortal traditions, Navyug Publications, ... May the plants be honey-sweet for us; may the Sun be all honey for us and ... .
^ Munro, E.C. (1996), Wedding readings: Centuries of writing and rituals on love and marriage, Penguin Books, ISBN 0-14-008879-2, ... May the nights be honey-sweet for us; may the mornings be honey-sweet ... .
^ Macfarlane, M. (1999), Wedding Vows: Finding the Perfect Words, Sterling Publishing Company, ISBN 0-8069-0639-1, ... we are word and meaning, united ... .
^ Misra, R. (1939). Sri Saptapadi Hridayam. Bharatpur, India: Amrit Vagbhava Acharya. ^ Srinivasan, A.V. (2009). The Vedic Wedding: Origins, Tradition, and Practice – Including a step-by-step wedding ceremony in Sanskrit with English. Periplus. pp. 64, 132–152. ISBN 9780978544300. .
^ a b Pauwels, H. (2004). Bose, M. (ed.). Only You: The wedding of Rama and Sita - Past and present in the Ramayana, revisited. Oxford University Press. pp. 165–189. ISBN 978-0195168327. .
^ Singh, M. M. (1967). Life in North-Eastern India in Pre-Mauryan Times: With Special Reference to 600 BC–325 BC, pp. 48–49. Motilal Banarsidas Publisher. ^ Banerjee, G. (1879). The Hindu Law of Marriage and Stridhan, pp. 108–110. Thacker, Spink, and Company. ^ Jha, J. C. (1976). The Hindu Sacraments (Rites de Passage) in Trinidad and Tobago. Caribbean Quarterly, p. 40–52. ^ a b c d Gray, J. (2009). "Marriage ritual in Nepal: Space, performance in tacit knowledge". Journal of Ritual Studies. 23 (1): 45–60. .
^ CBS News. (2012 February 12). India's love affair with gold. ^ Kitco Metals Inc. (2013 July 23). India, the Rupee, Import Duties, Gold and Diamonds. New York: Kitco Metals. ^ IBEF – a trust established by the government of India. (May 2013). Gems and jewelry industry in India. ^ International Monetary Fund (IMF). (February 2013). India - Country Report 13/37. Washington DC: IMF. ^ Jyoti, A. (2003 Mar-Apr). Marriage is a Sacred Bond and Pledge. ^ All World Gayatri Pariwar official website. ^ "All World Gayatri Pariwar Magazine". Archived from the original on 6 September 2012. Retrieved 7 September 2012 – via archived copy. .